Between Trim and the pretty little town of Summerhill stand the ruins of DANGAN CASTLE, celebrated as being the birthplace of England's greatest general, ARTHUR DUKE OF WELLINGTON, who, on the 1st of May, 1769, came "into this breathing world," unheralded by any prodigy, undistinguished by any omen, which might foreshadow the high and glorious destiny which awaited him. The remains of the ancient castle consist of the outer walls of the keep, to which a modern mansion, built in the Italian style, has been added by one of the modern possessors. The general effect of this once noble edifice must have been exceedingly beautiful when viewed in its perfect state, with its battlements and turrets emerging from the crowding woods. But unfortunately the demesne and castle passed from their original possessors into the hands of strangers: they were sold by the Marquis of Wellesley to Colonel Burrows, and by him let to Mr. O'Connor. While in the possession of the latter gentleman it was destroyed by fire, and all that now remains of this once stately pile is a naked and desolate shell. The noble woods, too, which adorned the demesne, have shared in the general destruction; and all the giants of the sylvan scene have been prostrated by the ruthless axe. How different was the appearance it presented when Mr. Trotter visited it in 1814! "From every part of the adjacent country," he writes, "the woods, and frequently the Castle of Dangan, were visible. We continued to walk on magic ground:—the varied landscapes of a fine corn-country, always terminated by the widely extended woods of Dangan, could not but please." Yet even at that time decay and neglect had begun to do their work upon the place, for he also remarks, that "the improvements and lakes which once highly adorned the demesne are lost through neglect, and the fine gardens are uncultivated." 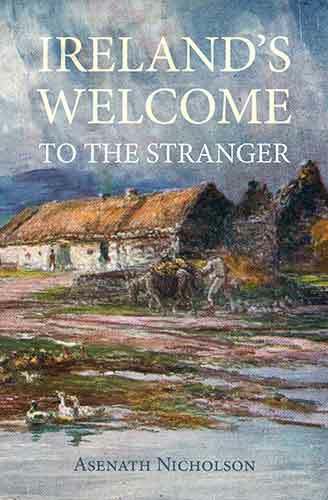 This intelligent traveller learnt, while lingering in this neighbourhood, that a cottage, in which the Duke of Wellington had resided in great privacy for two or three years, when the Marquis of Wellesley was proposing to sell Dangan, was to be seen near Trim. If this retreat of the future victor of Waterloo be still in existence, we were not fortunate enough to see it. Mr. Trotter thus describes his visit in a very animated manner:—"We proceeded," says he, "with much eagerness to this little country-house: we soon saw it buried in trees. We reached the gate of its avenue, which is straight, of modest appearance and lined with tall ash-trees. The house is perfectly rural, with a small lawn, and pretty shrubberies round it; but very simple, and just fit for a small domestic family. The apartments are commodious, and all the accommodations good, but on the most modest scale. The garden pleased us most; it is good, and quite rural, suiting to the character of the place." It is not improbable that the duke was residing in this secluded habitation when his great rival, Bonaparte, was pursuing his splendid career in Italy. Even these venerable relics of its former grandeur have now disappeared, and "two small pillars which crown the summits of two verdant hills," are the only vestiges which remain to mark the birthplace of the illustrious warrior.